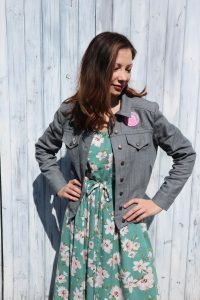 Is it wrong that I decided to make a denim jacket mainly as somewhere to display my sewing pins and patches?! 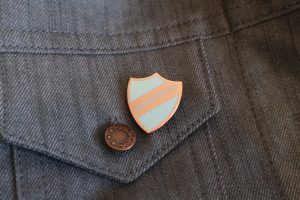 As denim is a sturdier, more durable fabric, it is the perfect place for your pin and badge collection. 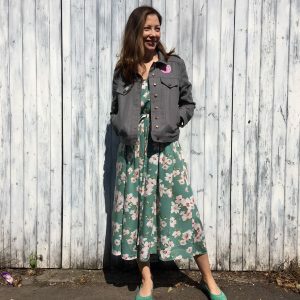 I had seen a couple of versions of the Seamwork magazine Audrey jacket (I’m looking at you Rhiannon and Vicki!) and thought it would be the perfect Spring/Summer jacket. 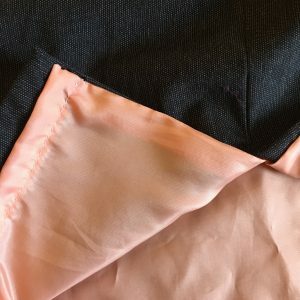 I decided to make it out of the grey slub denim that I have in the shop. 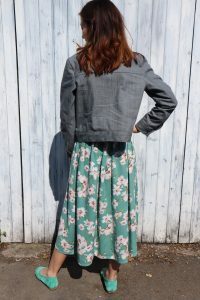 As I can’t bring myself to do double denim, I figured this would at least mean I could wear the jacket with blue jeans if I wanted to! 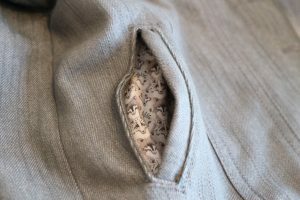 I had some Liberty Wolf Pack scraps left over, so I used that for the pockets. Size wise, I made the smallest size, on Vicki’s advice and it still does come up a little bit big, but actually, would be perfect for wearing over a hoodie once it gets cooler. I don’t mind it not being super fitted though as it is a casual jacket. In terms of construction, it was all pretty straightforward. 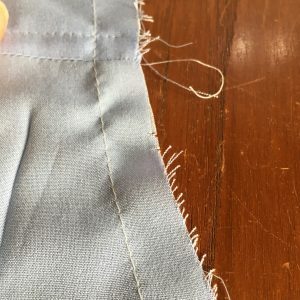 It calls for lots of nice neat topstitching, which I always enjoy. 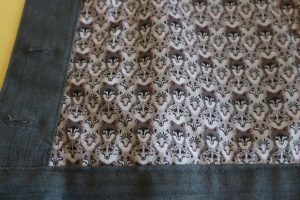 I chose to make a lined back yoke, from the Liberty fabric, as I just thought it would give the inside some interest. It is a completely unnecessary step, but sometimes you’ve just got to be a bit “extra”!! 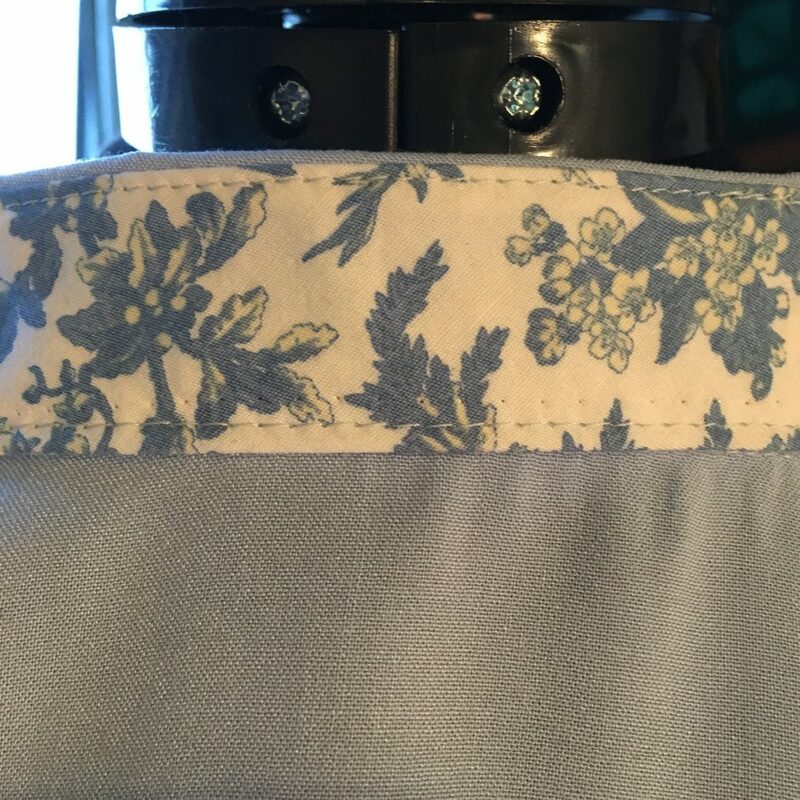 I also added a hanging loop between the collar and the back yoke. 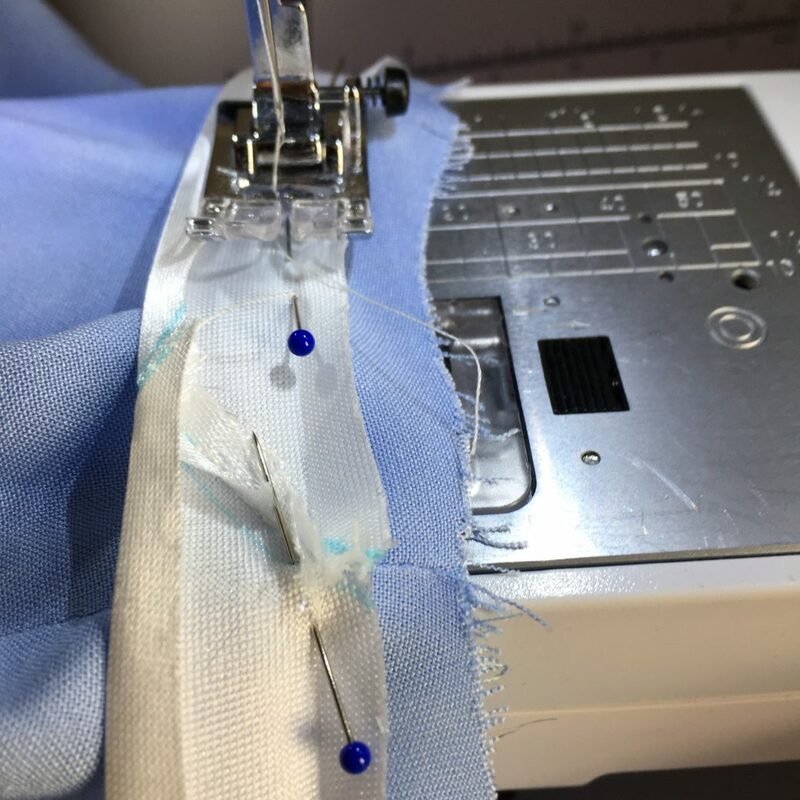 There are a lot of buttonholes to add, which I am always nervous about, and yes, I did have to unpick a few where my machine decided to misbehave! 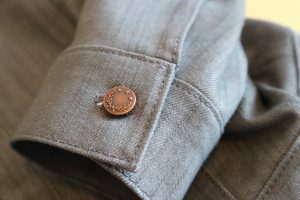 I installed the jeans buttons using my trusty Prym tripod and they went on like a dream. 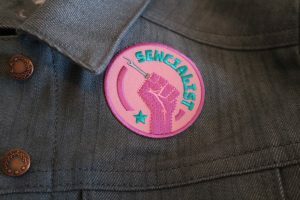 I have recently designed some sewing patches which are available in the shop now, and of course, I thought it only fit that one should take pride of place on my jacket. I think it goes perfectly! 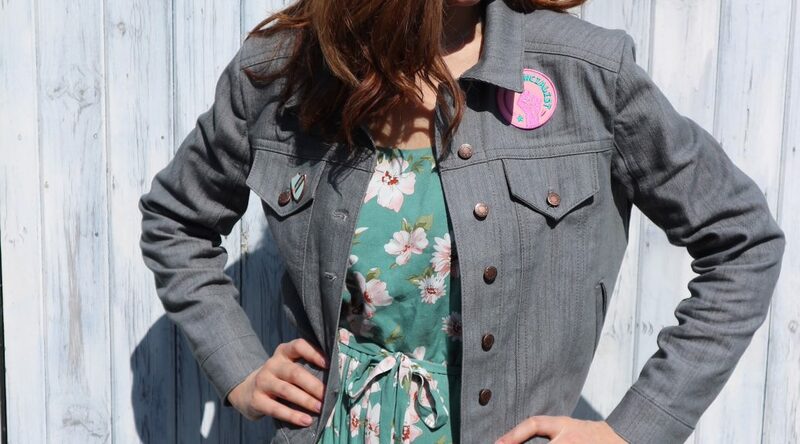 Overall, I really love the jacket, I think it will get a lot of wear over summer dresses this year. 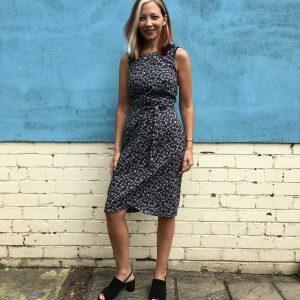 I made my first By Hand London Anna dress a couple of months ago and I absolutely love everything about it and resolved to make another one very soon. 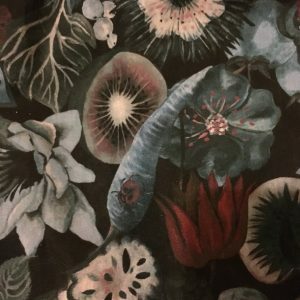 I was lucky enough to get some money for my birthday earlier in the month so headed to Liberty at the first opportunity and bought a couple of metres of one of their new collection cotton tana lawns – Earthly Delights. I thought it would be perfect for another Anna and as it is on a black base, it would still be good to wear in winter with tights, but I decided to make it fully lined so I wouldn’t have to worry about it riding up. For the previous version, I had done the slash neck option but I decided to try out the v neck for this one. Having looked at a few pictures of other people’s makes on Instagram, I took the decision to take the v down about half an inch as I thought that would look more flattering. I think I might split the difference though next time, as it is maybe a teeny bit low for work, without a cami underneath! The other major change I made, was to abandon all of the facings and line the top instead. 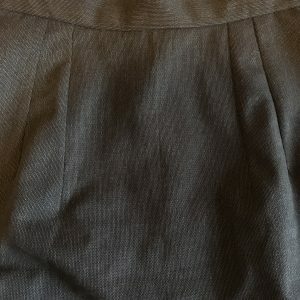 I think this gives a much nicer finish, and as I wanted to line the skirt, it made much more sense. I managed to engineer it so that I could machine stitch all of the seams to make it a really clean finish. if you would like more details or a tutorial on how I did this, please let me know! 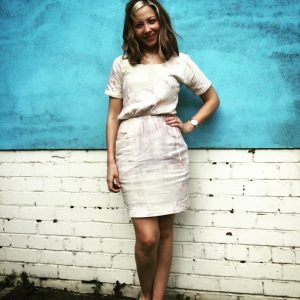 The Liberty lawn was such a pleasure to work with – if you’ve been working with slippery or difficult fabrics for a while, it is such a refreshing change to work with something that just behaves itself! The biggest challenge I had though was when it came to pattern placement. 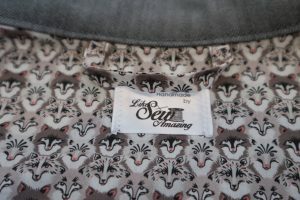 The fabric contains lots of fruits and vegetables that, if placed incorrectly could be quite comical. There are some very phallic looking carrots and some very “yonic” looking fruits – look at me, I learned a new word. Basically, I didn’t want to end up with any of these in the wrong place but it did create the hashtag #secretvajayjay! I also had to avoid any melons on my er, melons! Amazingly, I managed to avoid all of the pitfalls although cutting out did take a lot of thought and consideration! 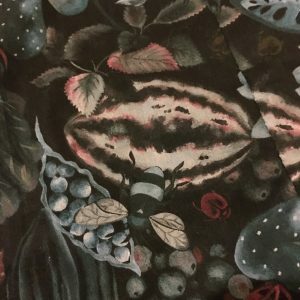 Had I bought the fabric online, I may have been more clued in, as the website describes it as capturing “a hidden fairy-tale world of thick foliage and luscious fruits, presented with a delectably twisted sense of humour”! 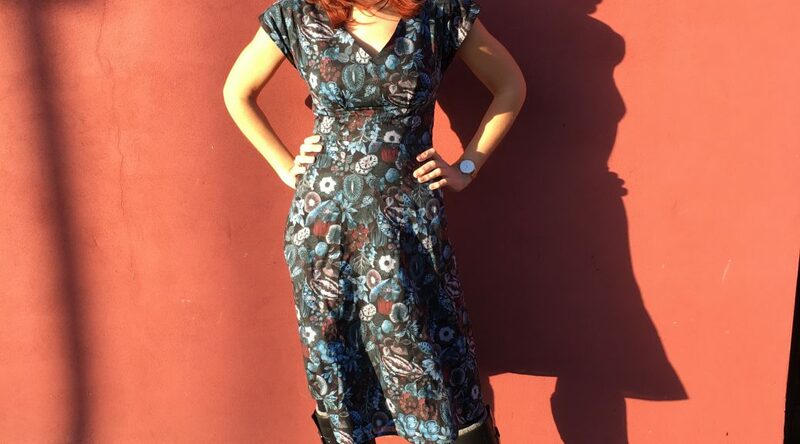 So yes, secret vajayjays aside, I have a lovely new Anna dress and it is one of my favourites! 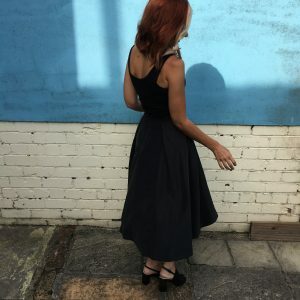 I recently recorded a vlog about my favourite patterns for workwear and I thought I would share a bit more information about a couple of garments that I made this week – the By Hand London Charlotte pencil skirt and the True Bias Ogden cami top. 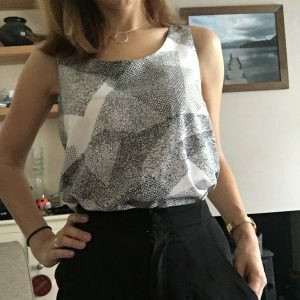 I had enough cotton suiting fabric left over from my Pauline Alice Sorell trousers to squeeze in a pencil skirt and I decided on the BHL Charlotte pattern as I really like their sizing as it seems to suit my shape. You do need to be aware that there is no ease built into this pattern so make sure you take this into account if using a fabric without any stretch. I ended up letting the side seams out by half an inch on both sides just to give myself a bit more room to move. 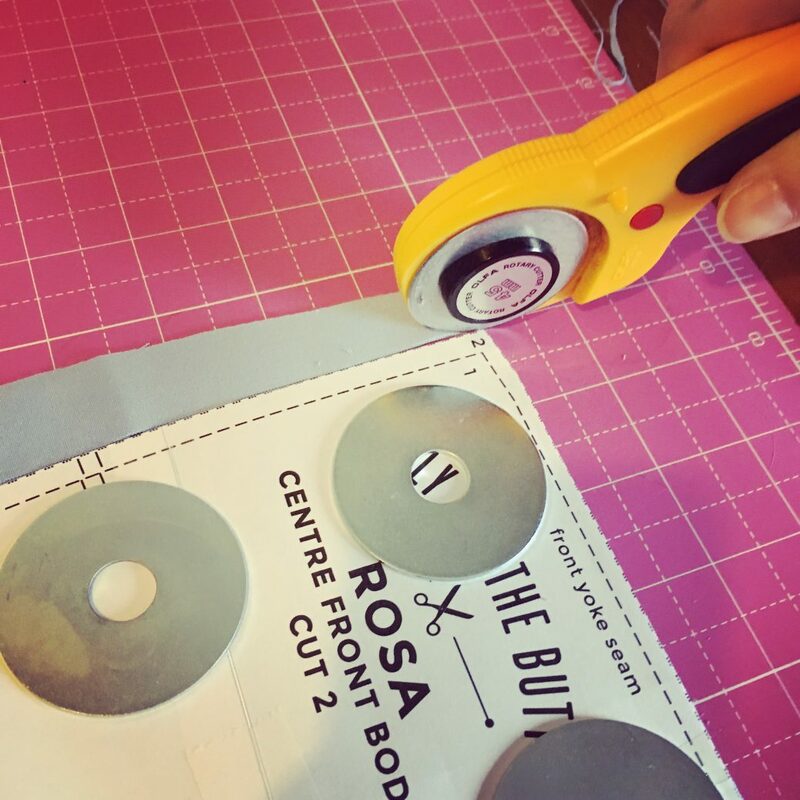 I also cut the waistband slightly longer so that I could give myself the option of making it slightly bigger if necessary. 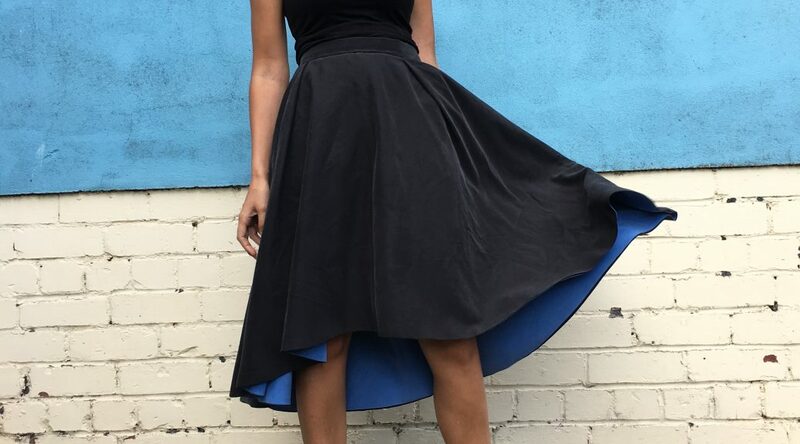 The long darts give the skirt a lovely shape. 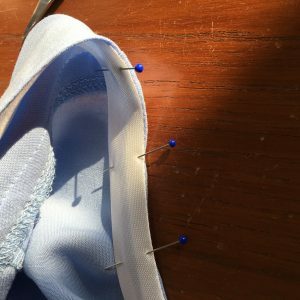 There were a lot to sew as I decided to line mine but they work really well. 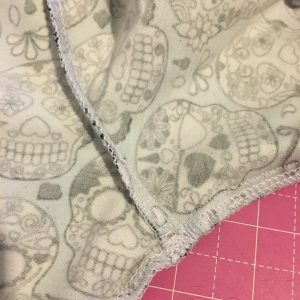 The pattern doesn’t state that you should interface the waistband, but I always find that interfacing helps waistbands keep their shape so I used it in mine. 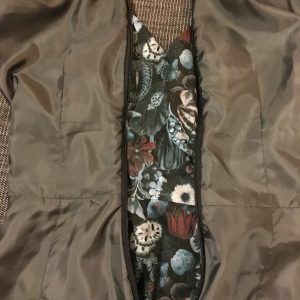 I used a black snap fastener for the waistband and I used my Prym vario pliers to install it. 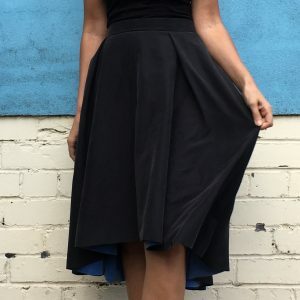 While I love Elisalex’s midi length version on the BHL website, I finished my skirt just below the knee as I thought it would be more practical. 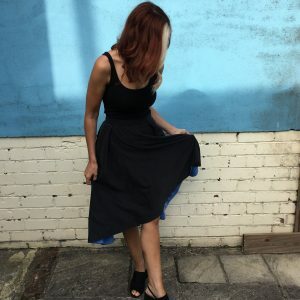 I also created a 5 inch slit at the bottom of the skirt to allow me to get up and down stairs and in and out of cars more easily! 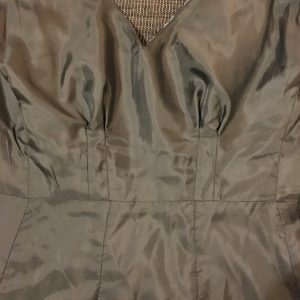 I finished the hem of the lining with machine stitching as it won’t be visible from the outside and then I used my blind hem foot for the main fabric. 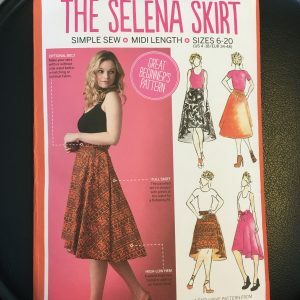 Make sure you check out the BHL Charlotte sewalong for lots of useful tips on how to make the skirt. 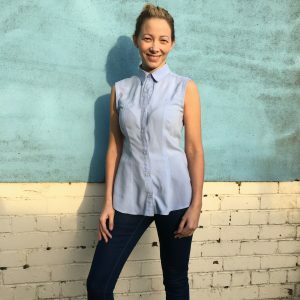 I have only recently bought the Ogden cami pattern but having made one recently for a night out, I have to say I absolutely love it. 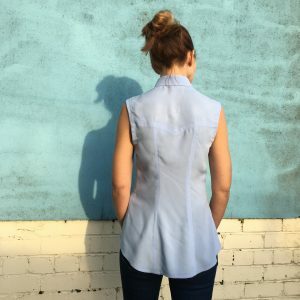 It’s really versatile and makes a lovely flattering top. 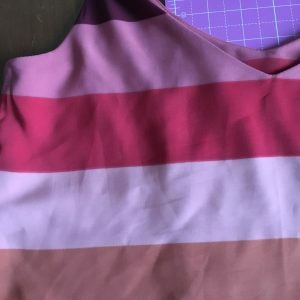 I found a few pieces of this striped peachskin fabric at the fabric and pattern swap at the Sewing Weekender and snapped it up as I thought there would be enough to make a top. 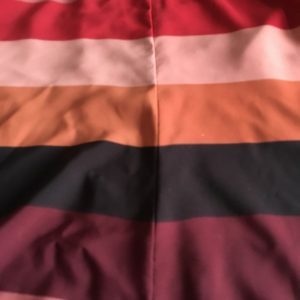 I took care to match the stripes when cutting out and sewing and it has turned out beautifully! I even had enough fabric to make the facings too so it worked out really well – especially since the fabric was free! 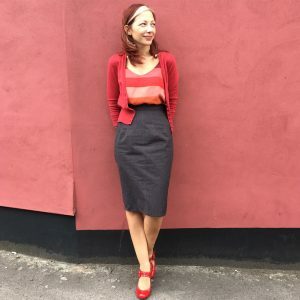 I think some people may worry that the Ogden cami could show a little too much skin for work, but I have teamed it with a fitted red cardigan and it works perfectly. 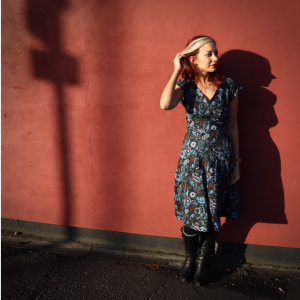 The Charlotte skirt and Ogden cami are a great match but would work equally well mixed with other patterns. 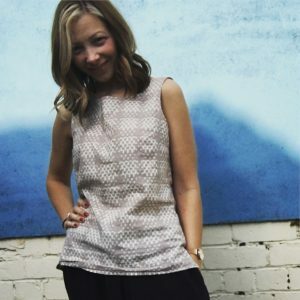 I just love versatile separates! 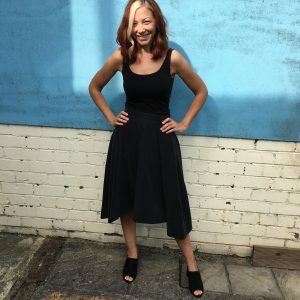 Week two of Me Made May is officially over and what a week it was! I started my new job today so decided to go in reasonably smart until I knew what the dress code was. 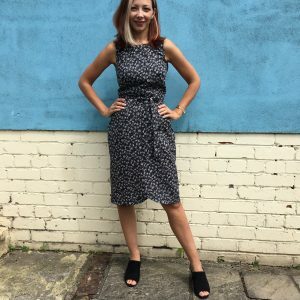 I chose my latest Colette Patterns Moneta dress, in the autumnal leaf print as I can wear it with tights, it looks smart but is one of the comfiest dresses in the world! 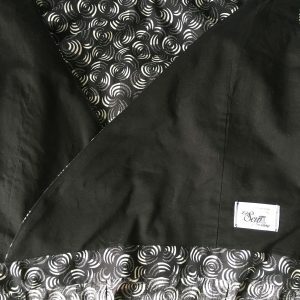 I opted for my Kommatia Patterns black Palazzo pants that I recently tested, teamed with my Sew Over It Silk Cami in this fab black and white rayon. My grey Driftless cardigan was a big staple this week too. 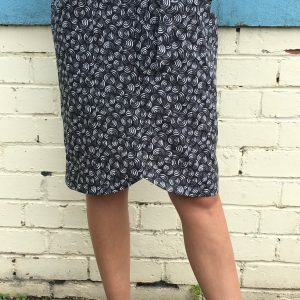 As the girls at work had been having a look at my blog, there was definitely some interest in the Toucan Zinnia skirt that I recently made. I paired this with another Silk Cami top in this stunning polyester silk from Sewn. This outfit definitely is a conversation starter! 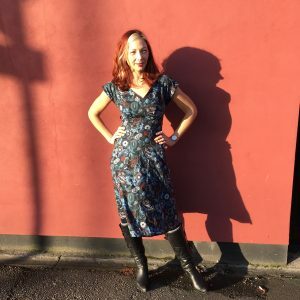 I was lulled into a false sense of security due to the previous day’s lovely weather so got my legs out in one of my Tilly and the Buttons Bettine dresses. 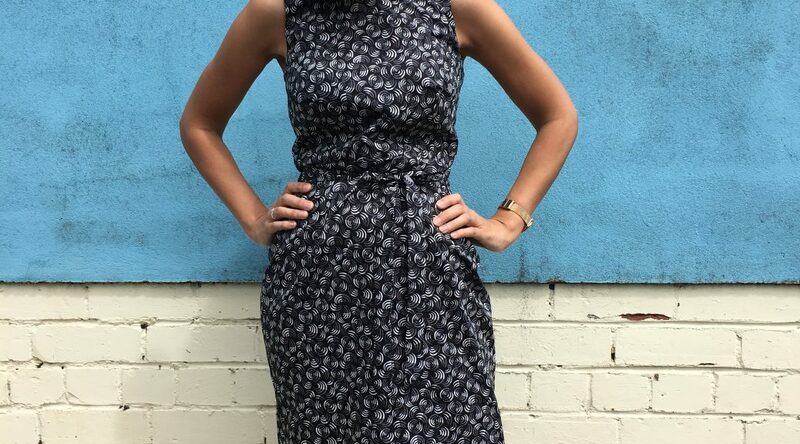 I adore this pattern, especially the pockets! The fabric is a double gauze that I bought from Miss Matatabi fabrics. I did manage to avoid the tropical thunder storms luckily! 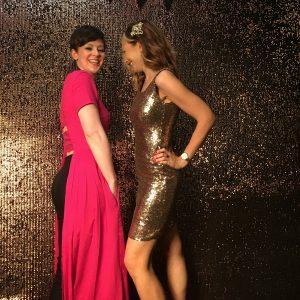 Friday was the day of the Dressmakers Ball, an event put on by the lovely Sarah and Freya of Crafty Sew and So, in Leicester. 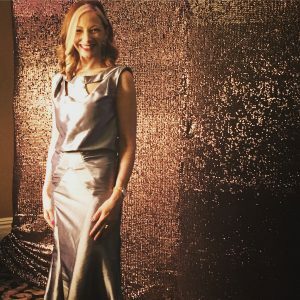 I travelled up there with my sewing buddy Amelia, and we got all glammed up in our me made finery! 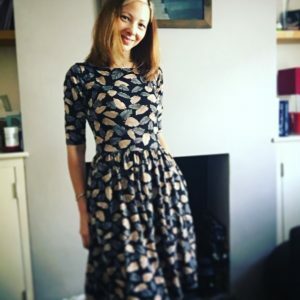 I decided to give my McCalls 7154 birthday dress another outing, as it was such a labour of love to make and definitely needed to be worn more than once! 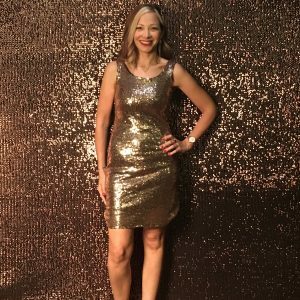 I also took my gold sequinned dress to get changed into for dancing! 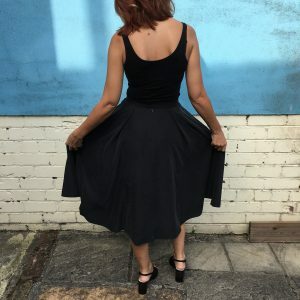 The event was such a lovely evening, where I got to meet lots of Instagram friends in real life and spend the night cooing over fabric, gossiping, making new friends and dancing! 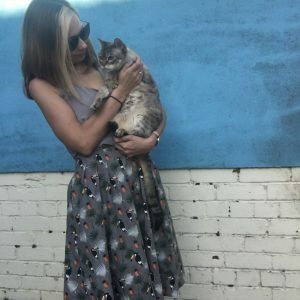 Due to a lack of sleep from the ball and a day of travelling, I get it casual in me made yoga pants and my lovely cat print blouse. 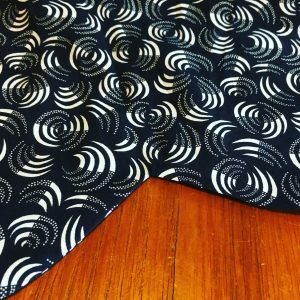 Again this fabric was from Miss Matatabi and is the prettiest, softest cotton lawn. 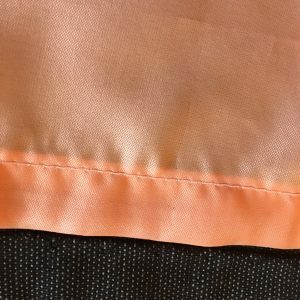 I may have also slightly broken my not buying fabric this month pledge, as there was a closing down sale at Sewn and some Robert Kaufman jersey that I had had my eye on for months was too good to resist! A day of life admin and visiting family meant double Tilly and the Buttons! 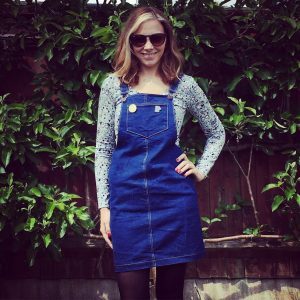 I think the the Agnes top and the Cleo dungaree dress work perfectly together. 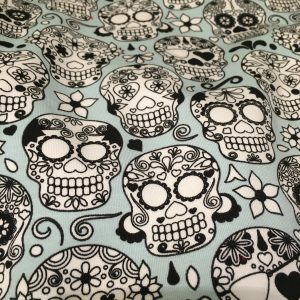 This was the first Agnes I made, from the gorgeous Sugar Skulls fabric from Fabrics Galore. 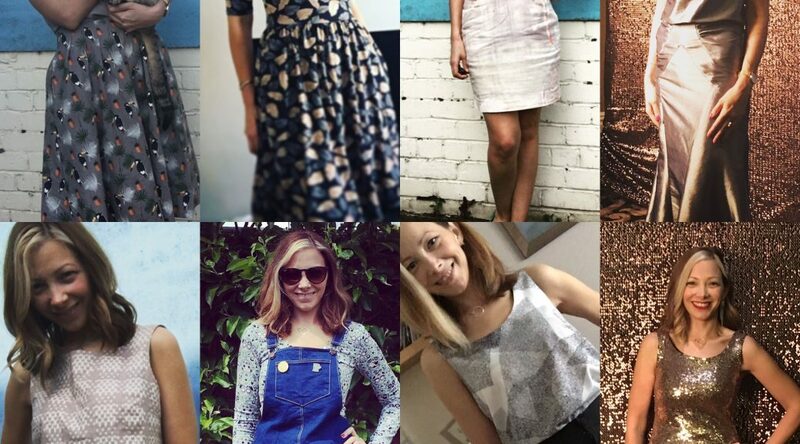 So, we are halfway through and I have still got lots more outfits in my handmade wardrobe to get through. Let’s see what the weather has in store! 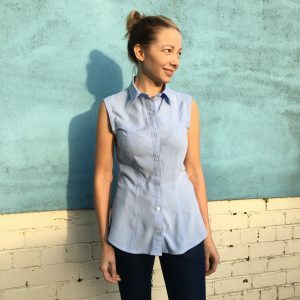 I have liked the look of the Tilly and the Buttons Agnes top since it was released but didn’t get round to buying it until I was at the Knitting and Stitching Show a couple of weeks ago. 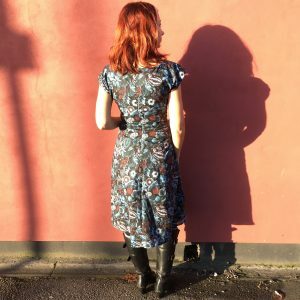 I thought about buying it while I was chatting to the girls on the stand, but it was only when I spotted the perfect fabric over at Fabrics Galore, that I headed back over to buy the pattern too. I made it up last weekend and absolutely love it! I only regret waiting so long to buy it! The pattern itself is a pretty easy make – just a front and back piece, two sleeves and the neckband and I managed to get it out of under a metre of fabric. 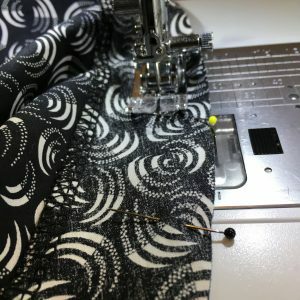 Due to SWT (sewing when tired!) 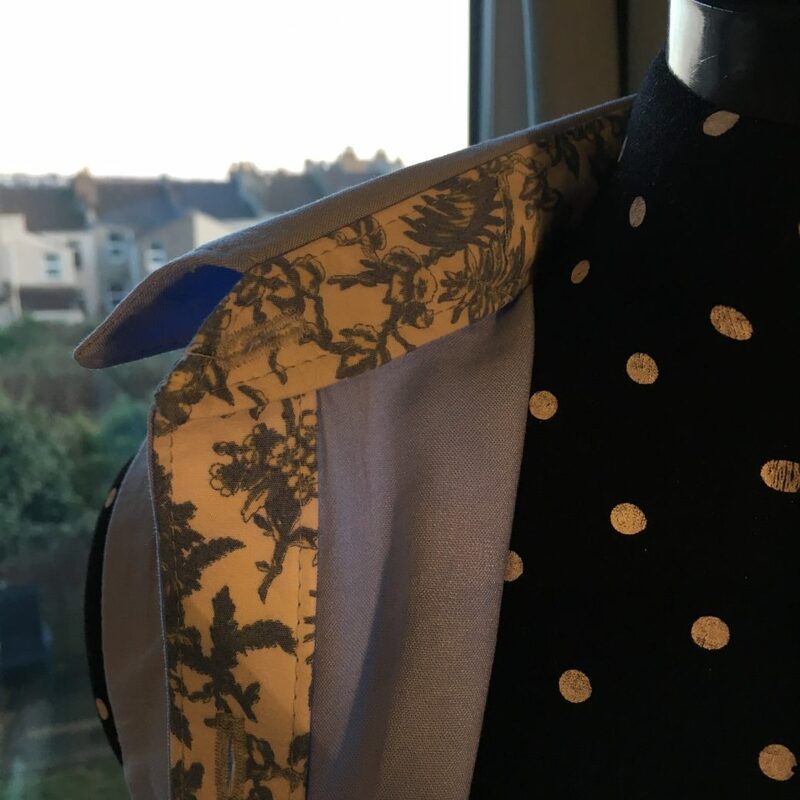 I made the very silly mistake of cutting out two back pieces, instead of a back and a front, but fortunately, the front piece fits neatly inside the back piece so crisis averted!! 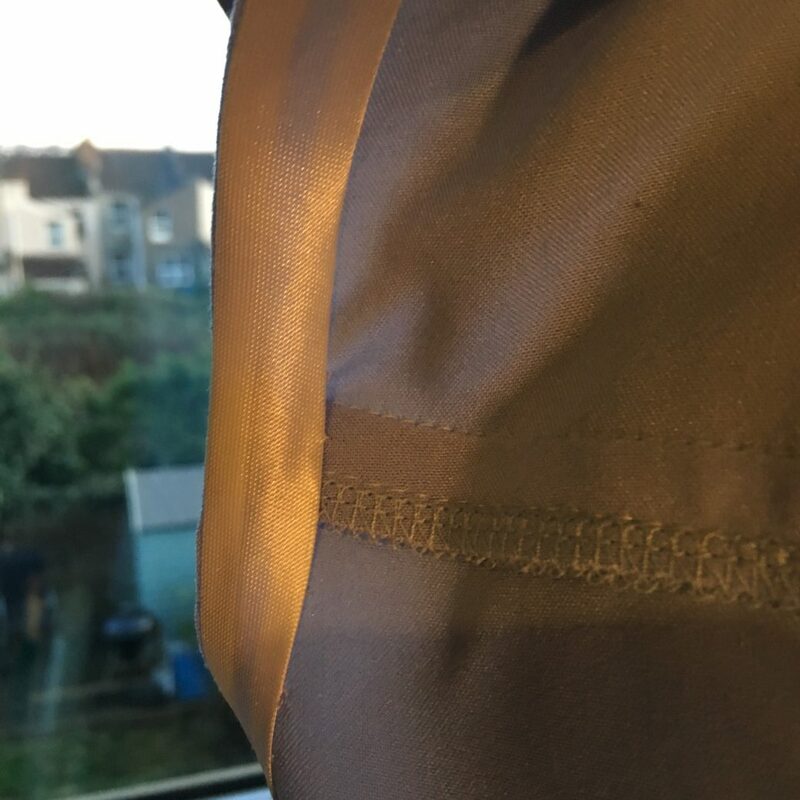 As the fabric edges were quite wavy, I used the design to line up the grain line and that worked really well. 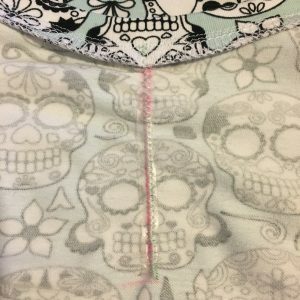 I used the upside down heart noses on the sugar skulls as a guide! 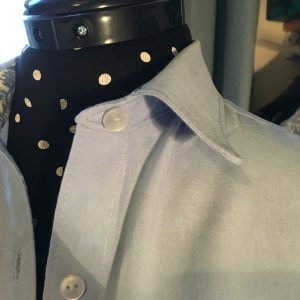 I cut out a size 2, as that was closest to my measurements, and as I wasn’t sure of the fit, I sewed it using the stretch stitch on my sewing machine and overlocking the edges, but next time, I will go straight to the overlocker. 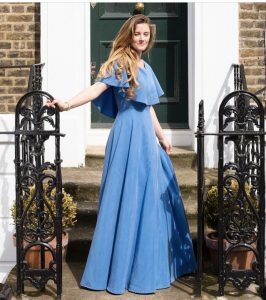 I chose to go with the plain sleeves on this occasion, as I thought that would show off the fabric better, but I went for the ruched neckline, as I think it is super flattering and adds some interest. I did this using the same clear elastic that I had used to stabilise the shoulder seams. 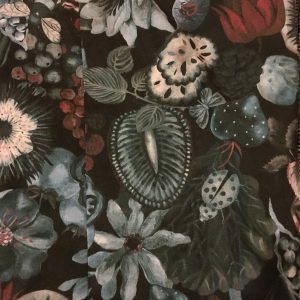 I didn’t make any changes to the pattern and I think it turned out really well. I used a narrow zig zag on the cuffs and hems, as I didn’t have enough thread for twin needling! 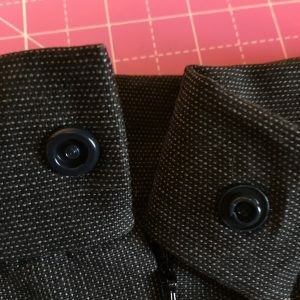 I did try out some stretch knit stay tape that I bought to prevent wavy hems but it didn’t work out as expected, as it actually removed all of the stretch from the fabric, meaning the cuffs hardly fit over my hands. I decided instead to remove it altogether and it worked out fine without it. 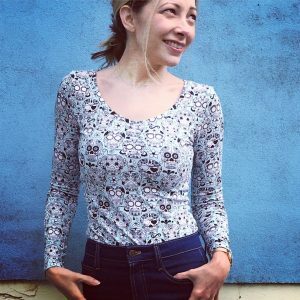 I can’t wait to make some more Agnes tops, as they are perfect for layering underneath dungarees or tucking into skirts. 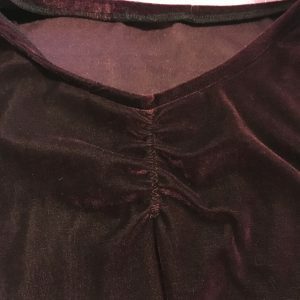 I am currently making an Agnes top hack for a Moulin Rouge theme costume from a burgundy stretch velvet. 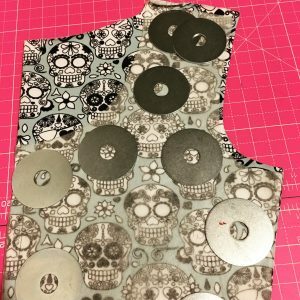 I am going to use a matching stretch lace to create capped sleeves and will shorten the bodice as I will be wearing an underbust corset over it. 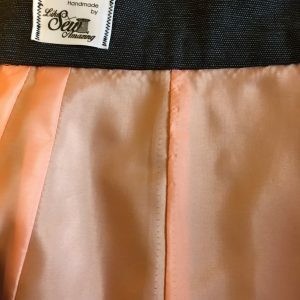 I will share more pictures of that one once the outfit is complete. 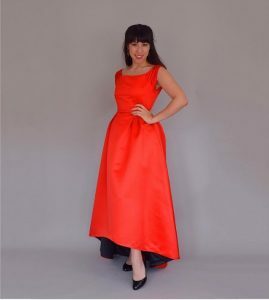 I can also see it working nicely as a dress, so will be on the look out for some suitable fabric for that. If you haven’t tried it already, you should definitely give this one a go!